The grade above is not a particularly good grade. But it’s not a particularly surprising one, either. In fact, it’s a grade you could accurately apply to most seasons of Saturday Night Live. The 39th season featured a lot of great sketches, and a lot of terrible sketches, and a lot of unmemorable ones. That describes every season the show has ever been on the air. Those that lament Saturday Night Live is not as good as it once was tend to selectively remember certain seminal sketches and forget the clunkers that surrounded them. Those who claim a previous cast was better than the current one forget there have only ever been a handful of top-to-bottom killer SNL ensembles—and that was a function of utility as much as talent. The show didn’t have a great season, but that’s not unusual—what makes this season somewhat subpar is unique. Rather than use recent cast departures to expand what the show could be by reaching out, Saturday Night Live narrowed its comedic perspective by looking in. At its best, Saturday Night Live has reflected and/or shaped the attitudes of its time. However, the current version of the show just doesn’t have a particular interest in the world at large, which makes topical sketches ring false and leaves non-topical sketches floating in a comedic ether. After its 2008 zenith involving Tina Fey’s Sarah Palin, SNL has struggled to have a place in the overall cultural landscape. Part of this has to do with The Daily Show, The Colbert Report, and even Twitter itself shortening the distance between real-world events and sarcastic response; another part has to do with the show ceding prominence to these and other outlets. Rather than competing with its own singular assets (actors portraying real-world figures being the primary one), Saturday Night Live decided to amuse itself. That self-centered focus was also reflected in its casting decisions, as the outcry over the six Caucasian actors hired in the summer of 2013 took the show by surprise. The show ultimately hired African-American comedian Sasheer Zamata in December 2013 after a series of secret auditions that never should have had to happen in the first place. Through no faults of their own, seven new cast members didn’t just have to deal with the pressure of being part of one of the most intense creative processes in any popular medium. They also served as lightning rods for Saturday Night Live’s historic inability to hire a cast that reflected the variety of cultural identity, experience, and perspective within the United States. It wasn’t just the casting mistakes that made the show feel more out of touch this season. Other ongoing sketch series like Inside Amy Schumer and Key & Peele offer distinct creative viewpoints through a variety of sketch premises. Rather than looking at the world and responding in kind, the current creative crew at SNL barely looked beyond the walls of 30 Rockefeller Plaza this year. Think of this as the “selfie” generation of SNL, with the show’s talented cast and crew hermetically sealed off from both the world and one other. The 17 cast members aren’t a comedic unit—they’re individuals locked in an airtight room, each trying to fight for the same oxygen. Mike O’Brien, a former writer promoted to the cast this season, produced some of the most singularly brilliant moments in recent SNL history with “Sad Mouse” and “2 Monster Pals.” But his sensibility exists in a vacuum, which makes it easy to identify but difficult to integrate with everything else around it. The fractured voices of Saturday Night Live have led to a fractured show, one that is as inconsistent as ever but for new and potentially unnerving reasons. Sketches like “(Do It In My) Twin Bed” and “Les Jeunes De Paris” suggest a cast that actually likes sharing the stage with one another. But more often, sketches serve one individual rather than an ensemble. To be certain: Cast turnover is a feature, not a bug, of Saturday Night Live. But it’s extremely possible that more than a few recently added cast members will depart the program without us knowing if they were actually any good. 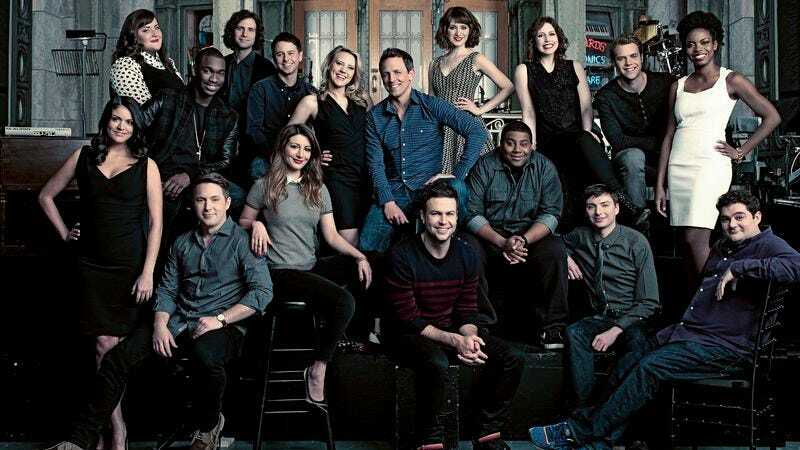 And it’s not just the new players who have suffered: Almost all of the cast members have disappeared for what feels like entire episodes at a time, even veterans like Vanessa Bayer and Jay Pharoah. The show doesn’t currently have a cast so much as a group of comedians that appear in sketches for varying amounts of time. The end result is a show that consists of individual contributions that remain isolated from one another when viewed as a whole. This doesn’t matter for the person viewing the show as an embedded clip on Sunday morning. But it’s a huge problem for the person staying up late and watching the show live. Saturday Night Live has a decision to make as it enters Year 40: Dedicate its energies towards crafting episodes or dedicate its energies toward crafting stand-lone pieces for future consumption. Ideally, the former would organically lead to the latter. But an emphasis on the second part has harmed this season’s episodes, and the show’s current identity as a whole. Maybe the landscape has changed so much since 1975 that its fall from omnipresence was inevitable and even healthy. But the show has not fought that slide into secondary status, choosing to focus on the micro rather than the macro when crafting its comedic voice. Saturday Night Live is still bursting with talent but has precious little to actually say. Rather than reflect on its own history in the upcoming year, it would be wise to start making some new history of its own.